Today a group of us were able to spend an hour with ~50 high school students from Cambridge, Mass., via Skype. Ship-to-shore communication is often difficult, so we were very happy that we were able to maintain video and audio connection for the entire conversation. The goal was to tell these students what we were doing out here, talk about what it’s like to work with Alvin, and more broadly what it’s like to do science at sea. The students sent in questions ahead of time so we were able to figure out which experts we should bring into the conversation. 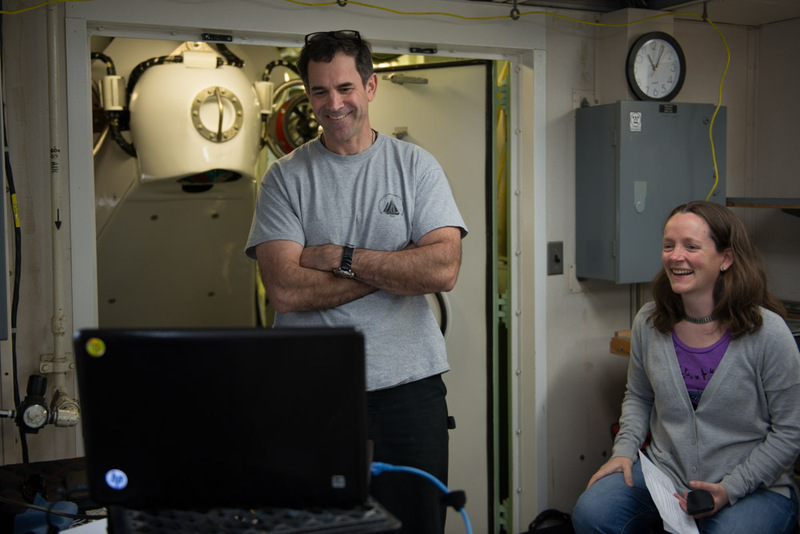 The Alvin Expedition Leader Bruce Strickrott discussed what it’s like to work with Alvin, some of the technical aspects of running the sub, the differences between human-occupied subs and remotely operated vehicles, and what it takes to become an Alvin pilot. He also discussed what the Alvin upgrade means to him as a pilot. 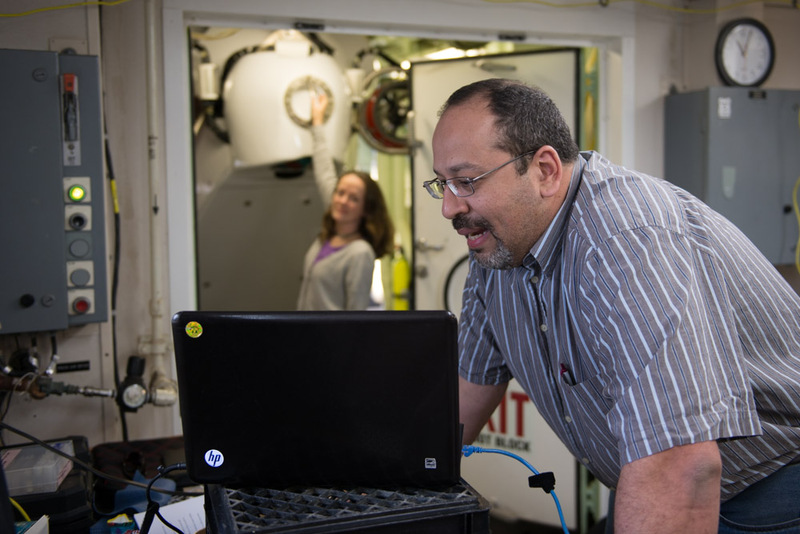 Chief Scientist Peter Girguis spoke about the goals of the expedition and discussed some of the science drivers for coming to the Gulf of Mexico. Catie Graver, one of the ship’s two science technicians, talked about all the behind-the-scenes things she does to enable our science. Jennifer Delaney (Girguis Laboratory manager) and myself (a grad student in the Girguis Lab) answered student questions about life at sea and how a young person interested in marine science could get into the field. Chris Linder (WHOI) spoke about being an expedition photographer and his transition from marine engineer and oceanographer to science translator and storyteller. After each person spoke we were able to field a few questions from students in the audience. In addition to the video chat, we also sent the student group on a virtual tour of the ship, the research vessel Atlantis. Chris Linder put together a video that included Pete and Jenny describing the ship and had some video and photos of the sub launch and recovery, as well as seafloor footage. We all emphasized the collaborative and interdisciplinary nature of the work we are doing here. Our science wouldn’t happen without all of the crew members. From the steward, cook, and mess attendant to engineers, Alvin pilots, ship’s mates, and the captain, getting science done at sea requires just about every type of expertise there is. We hope the students saw that one can be involved in marine science in many ways besides pure scientific research.